This entry was posted on April 27, 2013 by Tintean Editorial Team/fdg, in Book review, Of Literary Interest. Bookmark the permalink. 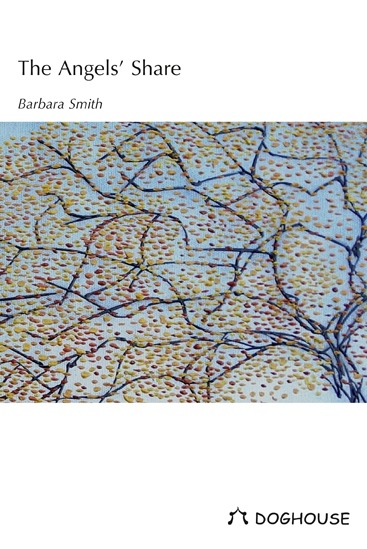 Barbara Smith’s second poetry collection, The Angel’s Share, has a broad sweep from past to present, from icy vistas to a torturer’s brazier, from a rag doll to an X-box game, from the raven battle goddess to the vernix of a twin birth. It opens with Shackleton and Antarctica; it moves to modern times of banjo and pipe, cattle, beer, procurement, needlepoint, and football colours; back to a sequence of Mallory Sonnets, which form the central section of the collection; and then forward to knitting, seahorses, acne, optometry and the clever hive-shaped poem, ‘Hexic’. So the view begins at the bottom of the world if you like and rises to the top of the world at Everest, and a winged view of mortal endeavour. Of a teenager gazing in the mirror she asks, ‘Are you Narcissus wielding a mobile,/ thumbing swift-boot texts to a sullen Echo?’ And in another poem the boy is mythic Icarus rebuking his father: ‘I am the payment that you will make:/the interest owed on science for your art,/the fall from joy that cannot be recaptured.’ The evocative title uses a distiller’s reference for the evaporation from casks of ageing whiskey. The title reflects most of the content; it encompasses the cost in gaining the target, the water-of life, the summit, looking down, looking back, plummeting from grace, toil and tithes and the shadow side. The most effective poems within it explore the sense of loss to which it alludes. Yet some poems are an awkward fit like a parody of breast slang dedicated to Dolly Parton: ‘Steadying for the ask, he addresses/my full frontals, my baby buggy bumpers,/my Brad Pitts, my boulders, my billabongs.’ This exhaustive list has an engaging subtext of social comment but it sits poorly with the title and the collection. Attention to the thematic thread in content choice would have given this volume more cohesion and clout. In the first poem when describing Shackleton’s wooden Antarctic hut, she says: ‘this wood basilica/became our only world: the esoterica/of each man’s interests….’ Smith certainly catalogues the esoterica of these famous explorers. While the objects are interesting, their delivery seems more like devoted inventory than poetry: ‘herring, peas and beans, soi-disant “fresh” sardines,/Heinz spaghetti, sliced bacon, Hunter hams;/biscuits, Ginger Nuts, Rich Mixed, tins of jam….’ The first of the twenty-one Mallory Sonnets, ‘Summiting’ reeks of platitudes: ‘You must know the end to be convinced/that you can win the end…’ and ‘The conquered enemy is just ourselves….’ These hackneyed phrases detract from the powerful historical material, which was more evoked in the preface to this section than in the poems themselves. Therefore, I preferred the other sections of the book animated by the poet’s direct observations and not burdened by that epic tragedy of Everest. Schooled in Newry, Barbara Smith lives in County Louth. As a mature-age student she attained an MA in Creative Writing from Queen’s University, Belfast. Her first poetry collection, Kairos, was also published by Doghouse Books in 2007. She received the Annie Deeny Prize in 2007 and was awarded in Scotland’s Wigtown Poetry Competition. She is a creative writing tutor and performer of her work. Her writing appears in journals in Ireland, UK, USA and Australia. Meg is Poetry Editor of Tinteán, and a much-awarded poet in her own right.